How To Keep Your Car Clean When You Have Messy Kids! Which Color Car Gets Dirtiest the Fastest, Black or White? 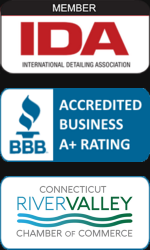 M&M Auto Detailing, LLC is a Connecticut Car Detailing service that offers Automotive Detailing, including Interior and Exterior Detailing, as well as 3M Vehicle Film, Dent Removal, Headlight Restoration, ProtectALL Protection and Window Tinting.